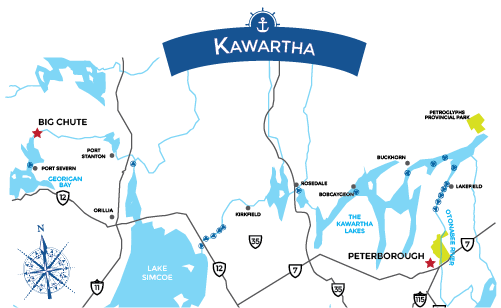 Due to its proximity to the greater Toronto area, the Kawartha Lakes and the Severn River are very busy in the summer with a wide range of boaters. 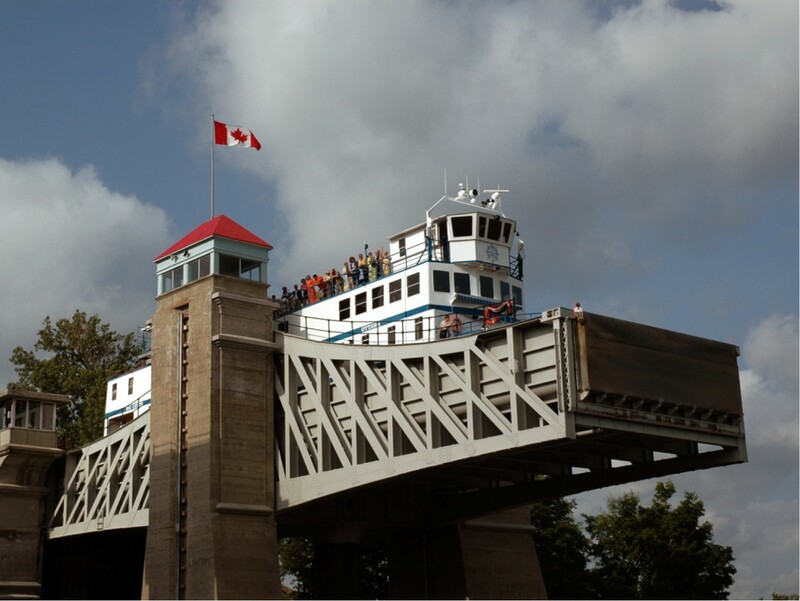 Our Kawartha cruises showcase a greater diversity of engineering including the Peterborough Lift Lock, the Kirkfield Lift Lock and the Big Chute Marine Railway. 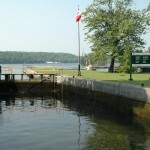 In 1920, the Trent-Severn Waterway was opened to thru navigation across central Ontario from Lake Ontario to Georgian Bay. 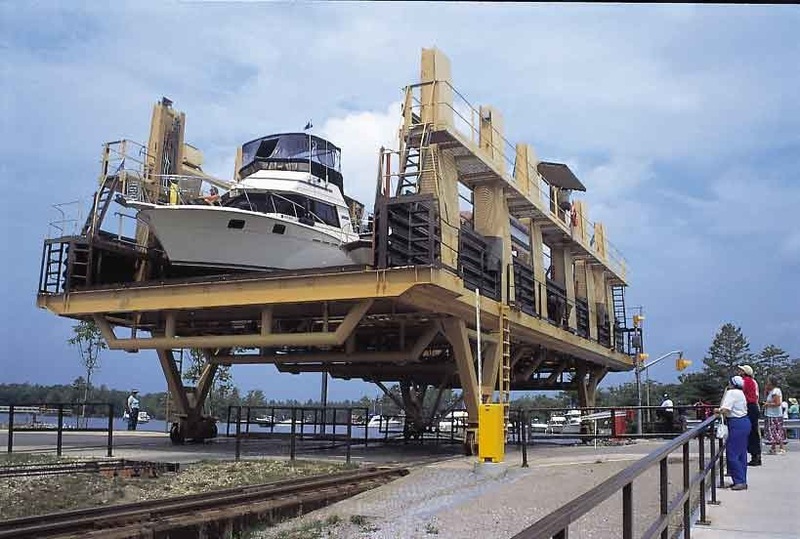 This 386 km stretch of scenic lakes, rivers and locks was created over a period of 87 years in conjunction with the water transport needs of the local lumber industry and the neighbouring communities. 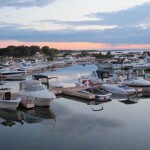 Subsequent ongoing development and improvements to the infrastructure since 1920 have resulted in a modern recreational waterway which locks over 120,000 boats per season. Parks Canada is responsible for the maintenance and operation of the 43 locks and 125 dams controlling the water flows in this 18,600 sq km area. 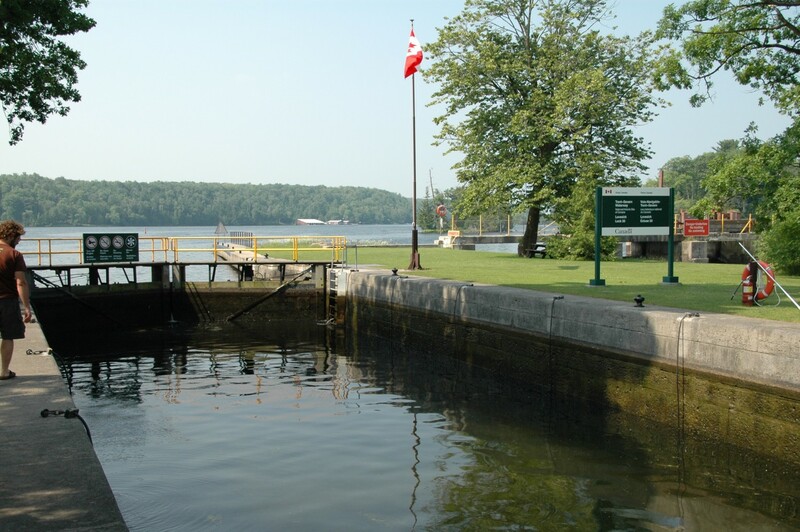 Of the 22 locks we travel through, there are some manually operated “heritage” locks as well as modern hydraulic locks built to service the areas of heavier boat traffic. All fares per person double occupancy. Single occupancy 75% over regular fare (except cabin #7 single). Total price shown above includes your room, all meals and snacks aboard ship, luggage handling, bus transportation to depart from or return to cruise parking base, free parking, cancellation refund plan, 13% Harmonized Sales Tax on the fare and 8% Retail Sales Tax on the cancellation refund plan. First meal served is breakfast on morning following embarkment. Snack will be served on boarding night. You are welcome to pay the $200. per person deposit in US funds. It will be converted to Canadian dollars at the current exchange rate and your confirmation will show your remaining balance in Canadian dollars. If you would like to pay your final balance in US funds, you must call our office one week before it is due to obtain the figure. * An asterisk beside any cruise date means that cruise is fully booked and a wait list is available. There is no obligation to place your name on any wait list. We usually get a couple of cancelations per cruise. Passengers board our chartered bus by 6:00 p.m. at the Peterborough Holiday Inn. There is free car parking at the Holiday Inn. 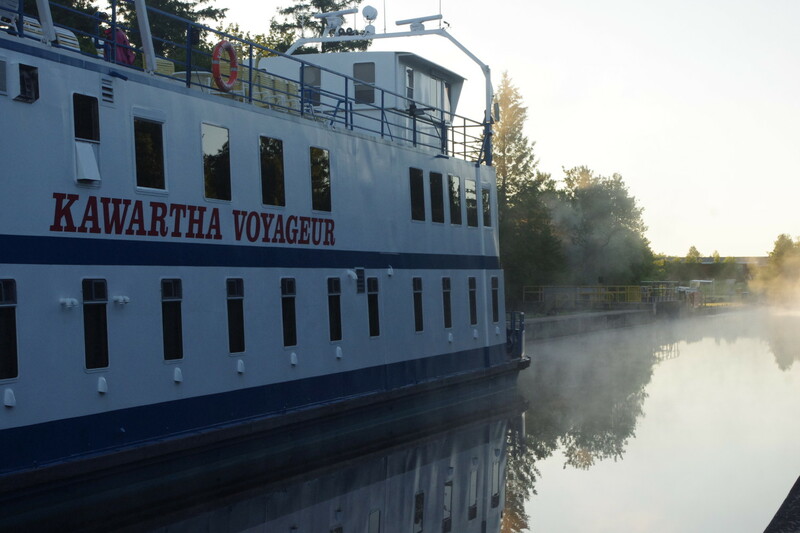 Bus arrives at Big Chute shortly after 8 p.m. for embarkation on the “Kawartha Voyageur’ which will remain docked for the night at Big Chute. 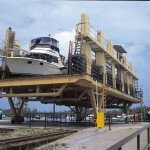 After viewing the Big Chute Marine Railway we depart about 9:30 a.m. up the Severn River with its rocky gorges and islands. Our first lock is the highest mitre lock on the system, Swift Rapids. Then through Sparrow Lake, the upper Severn River to the aqua waters of Lake Couchiching, and to Orillia’s lovely downtown waterfront. A morning crossing of beautiful Lake Simcoe places us by noon at the Gamebridge entrance to a series of locks and canals above the level of the adjacent farms. Then on through man-made Canal Lake with its tiny “marble-arch” bridge–a must for photographers as we pass through. 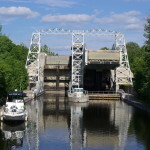 We reach our overnight stop at the massive Kirkfield Lift Lock in a tranquil rural setting. From Kirkfield we journey through several miles of narrow man-made canal to Balsam Lake which is the highest point of the Waterway between Georgian Bay and Lake Ontario. Across Balsam, through Rosedale Lock, and across Cameron Lake we come to Fenelon Falls with its scenic waterfall and rocky gorge. Then on through Sturgeon Lake to Bobcaygeon, the hub of the Kawarthas and a particularly pleasant setting for the night. This day is a progression of beautiful Kawartha Lakes and their joining locks and villages: Pigeon Lake through Gannon Narrows into Buckhorn Lake; Lower Buckhorn Lake into Lovesick Lake with its legend of unrequitted love; Burleigh Falls into Stoney Lake and its thousand islands; Hell’s Gate with its Little Church on the Rock standing guard; then Clear Lake, Young’s Point and finally Lake Katchewanooka to our overnight stop at Lakefield. 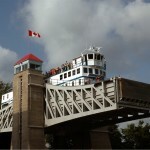 Our final day is a busy journey down the Otonabee River through a series of seven locks including the great Lift Lock to our base at Peterborough Holiday Inn around 2:00 p.m.
Embarkation starting at 8:00 p.m. at the Peterborough Holiday Inn. There is free car parking at the Holiday Inn. 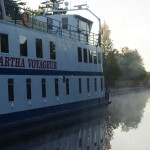 The “Kawartha Voyageur” remains docked at the Holiday Inn for the night. Sailing after breakfast the “Kawartha Voyageur” ascends seven locks on the Otonabee River between Peterborough and Lakefield including the great Lift Lock. Entering the first of the famous Kawartha Lakes, Katchewanooka, just after lunch we continue up to historic Young’s Point then through Clear Lake, Hell’s Gate, with its lonely Church on the Rock standing guard and Stoney Lake to Burleigh Falls. After Burleigh we cross Lovesick and Lower Buckhorn Lakes to the village of Buckhorn where we dock for the night. 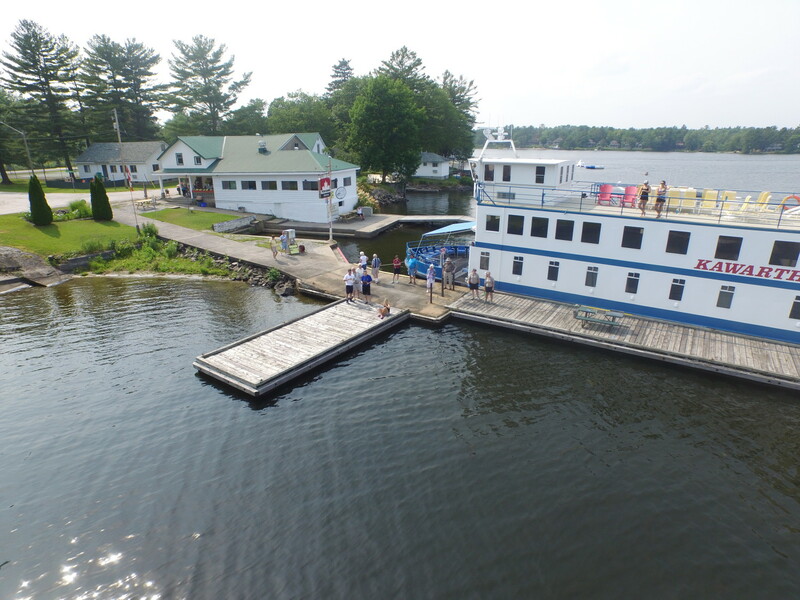 A leisurely departure from Buckhorn after the lock opens sets the pace for a relaxing day through Buckhorn Lake and Pigeon Lake, Bobcaygeon and Sturgeon Lake. 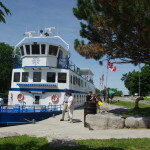 Later in the afternoon, we pass through the Fenelon Falls lock and cross Cameron Lake to our overnight stop at the beautiful Rosedale lockstation. 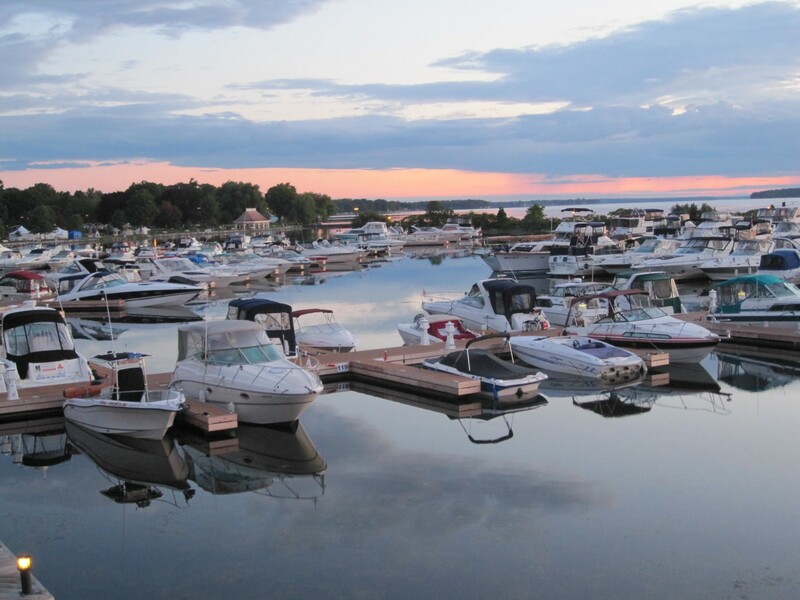 From Rosedale, we enter Balsam Lake which is the highest elevation on the Trent-Severn Waterway. 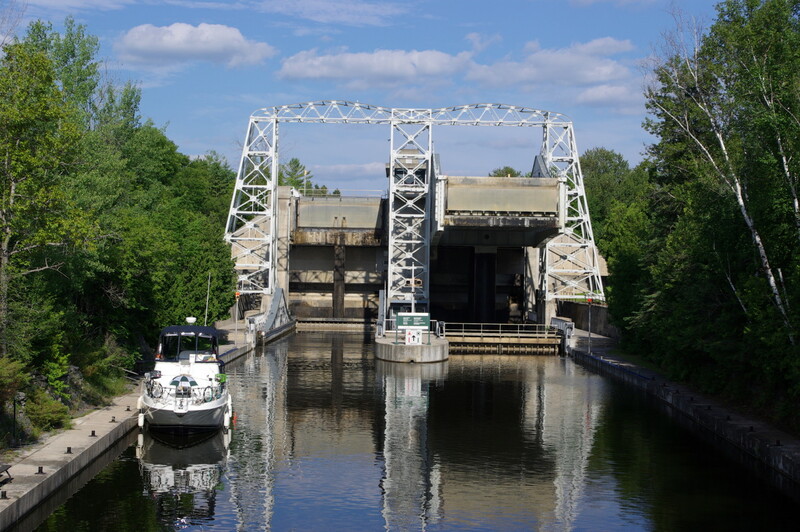 Then through several fascinating miles of narrow man-made cuts to Kirkfield Lift Lock followed by Canal Lake and the Talbot River to Lake Simcoe. 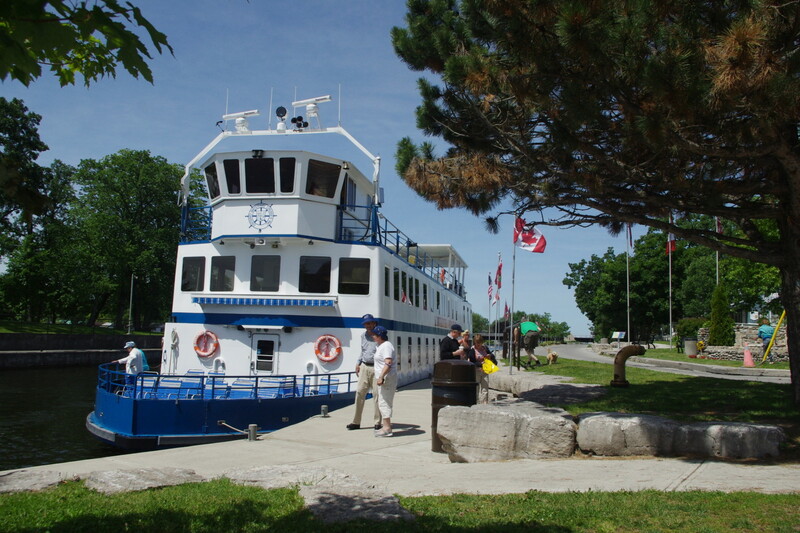 A late afternoon crossing of about 12 miles rewards us with an attractive overnight docking at the port of Orillia. After a morning of shopping or a visit to the Stephen Leacock home, we sail up Lake Couchiching to enter the Severn River at Washago. This section of the Severn down to Sparrow Lake offers a fine display of lovely homes and cottages. 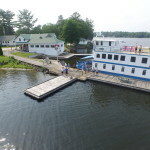 Overnight docking is at Port Stanton on Sparrow Lake. A final spectacular day cruising down the Severn River with its rocky grandeur, through the mighty Swift Rapids lock and then on to our destination at Big Chute Marine Railway. A two hour visit here caps our cruise before boarding a chartered bus to return to Peterborough with arrival around 5:00 p.m.
Each cruise offers a unique experience. Find out where this journey will take you using the map below.